Why do people choose to identify as a Republican or a Democrat? For Republicans, about as many (68%) cite as a major reason the harm that Democratic policies inflict on the country as cite the beneficial impact of GOP policies (64%). For members of both parties, other factors rank far behind the parties’ policies among reasons for choosing a party. 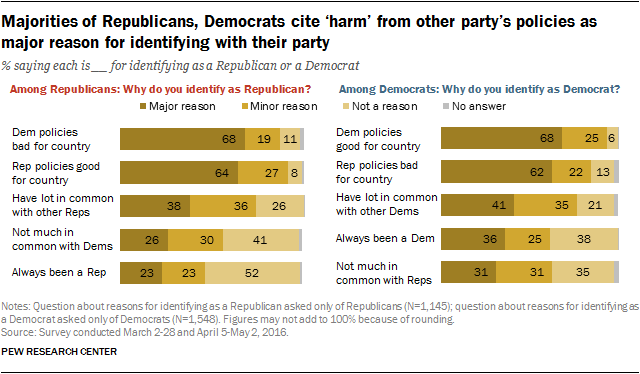 Roughly four-in-ten Democrats (41%) and Republicans (38%) say a major reason for identifying with their party is that they “have a lot in common” with the people who belong to the parties. Fewer people – 31% of Democrats and 26% of Republicans – say the lack of common ground with members of the opposing party is a main reason why they are a Democrat or Republican. Just 31% of Democrats cite long-standing ties with the party – “ever since I can remember I’ve been a Democrat” – as a major reason for identifying with the party. Even fewer Republicans (23%) cite this as a major reason they belong to the GOP. For independents who lean to the Republican and Democratic parties, the main motivation for leaning to their party is the harm that the opposing party’s policies cause the country. More than half of Republican leaners (55%) and 51% of Democratic leaners say harm from the opposing party’s policies are a major reason for leaning to their party. No other factor comes close – just 30% of Republican leaners and 34% of Democratic leaners cite the positive effects from their preferred party’s policies as a major reason. When asked why they lean but do not identify with their party, about half of Republican leaners (52%) cite frustration with GOP leaders as a major reason; another 40% say they disagree with the party on some important issues. These factors are cited less frequently by Democratic leaners: Just 28% say frustration with the Democratic Party’s leaders is a major reason they do not identify as Democrats, and 33% cite disagreements on key issues as a major reason. 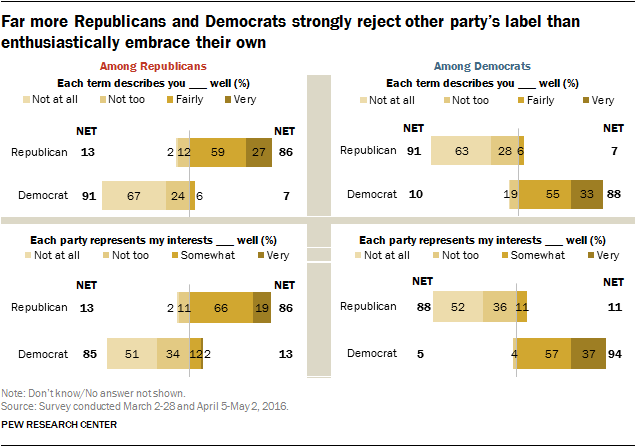 Far more Republicans and Democrats strongly reject the other party’s label than enthusiastically embrace their own. A wide majority of Republicans (86%) say that the term “Republican” describes them at least fairly well, but only 27% say the term describes them very well. However, more than twice as many Republicans (67%) say the term “Democrat” describes them not at all well. A similar pattern is seen among Democrats. Fully 88% of Democrats say the term “Democrat” describes them at least fairly well, but just a third (33%) say the party label describes them very well. As with Republicans, far more Democrats (63%) say the opposing party’s label describes them not at well than say their own party’s name describes them very well. Large shares of Democrats and Republicans credit their own parties with representing their interests at least fairly well. However, while 37% of Democrats say the Democratic Party represents their interests very well, only about half as many Republicans (19%) say the same about their party. Overwhelming shares in both parties say the opposing party does not represent their interests well, with about half in each saying the other party does not do at all well in this regard (52% of Republicans, 51% of Democrats). In another sign of their dissatisfaction with the Republican Party, fewer than half of Republican leaners (45%) say the GOP does well in representing their interests, while the Democratic Party does not do a good job. 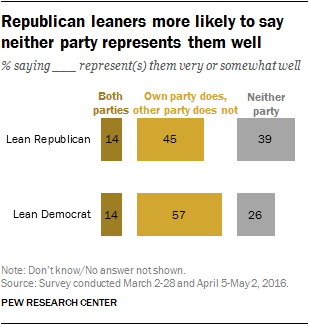 But nearly as many Republican leaners (39%) say neither party does well in representing their interests. Democratic leaners are more likely to say their party does well in representing their interests: 57% say this, compared with just 26% who say neither party does a good job. Most partisans say they have always thought of themselves as belonging to their current party, but about a third of Republicans (32%) say that at one point they thought of themselves as Democrats, while 22% of Democrats say they previously considered themselves Republicans. However, relatively small numbers in each party – 8% of Republicans and 7% of Democrats – say they have thought of themselves as members of the other party in the past decade. Young people are more likely than older adults to have thought of themselves as members of the opposite party in the past 10 years. Among Republicans, 16% of those under 35 say they thought of themselves as Democrats in the past decade, compared with 6% of those 35 and older. The pattern is similar among Democrats: 15% of those younger than 35 vs. 4% of older Democrats were Republicans in the past decade. Among independents who lean to the Republican and Democratic parties, most at one time thought of themselves as members of the party to which they currently lean. About six-in-ten Republican leaners (61%) say they once considered themselves Republicans, including 41% who thought of themselves as Republicans in the past decade. Similarly, 58% of Democratic-leaning independents say they once thought of themselves as Democrats (40% in the past decade). About a third of Republican-leaning independents (35%) say in the past they thought of themselves as Democrats, while a comparable share of Democratic leaners say they once viewed themselves as Republicans.